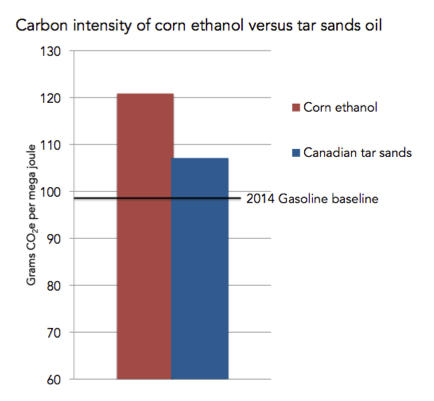 Using the Environmental Protection Agency’s own estimate, we calculate that the corn ethanol mandate has been worse for the climate than projected emissions from the controversial Keystone XL pipeline. What makes matters worse is that the EPA just mandated that more corn ethanol must go into American gas tanks. Today the EPA proposed new minimum volumes of corn ethanol that refiners would be required to blend into gasoline this year and the next. Congress set this policy, called the Renewable Fuel Standard, in the Energy Independence and Security Act of 2007. At the time, lawmakers hoped that using ethanol and other renewable fuels would reduce carbon emissions and American dependence on foreign oil. Last year, corn ethanol producers churned out 14 billion gallons, about 13.4 billion gallons of which were blended into the 135 billion gallons of gasoline the nation’s drivers used. Extracting tar sands and turning them into oil is more energy-intensive than traditional drilling for petroleum. According to the Natural Resources Defense Council, dirty oil transmitted from Alberta, Canada, to the Gulf Coast by the Keystone Pipeline would emit 24 million tons of carbon per year. So far the federal corn ethanol mandate has resulted in a massive influx of dirty corn ethanol, which is bad for the climate and bad for consumers. The only interest it benefits is the ethanol industry. As we’ve said before, it’s time for Congress to correct course and reform the broken Renewable Fuels Standard to make way for truly green biofuels. 1. Calculated by comparing the emissions from 14.3 billion gallons of gasoline (using 2014 baseline) to EPA’s estimate of corn ethanol emissions. Coal plant emissions use an estimate that a typical coal plant emits 3.5 million tons of CO2 per year.